These George men's Metropolis dress shoes are a classic dress style with clean lines, a practical and professional look at a great price. A true wardrobe staple, these shoes are a perfect pair for a multitude of occasions. Pick from the assorted colors. Bought as a gift for my husband. Nice looking shoe. Great for daily wear for an office job. Seems to run a bit large. Had to return for smaller size. Returnedvto the store and used store pick up for the exchange. This was great, quick, and convenient. A couple years ago Walmart carried a faded glory dress slip on very similar to this one. It was about the same price. These are nothing like those. They are cheap and flimsy. I would be shocked if they last more than a couple months. Unless you absolutely have to like I did, my husband needed them for work on Monday, I'd find something else. The upper being man made makes noise while walking; Also, Front of shoe is too low and tight, It folds in couple places; Also, Sole is very thin. Not the shoe pictured. The ones that came are ok and served their purpose but it would have been nice to get the style my nephew wanted. I wish I had read the reviews before purchasing. Lesson learned. I was sad to see that the picture on the website did not actually match the shoe I received. Last time I order shoes from Walmart's website. Same code and name as other George shoe carried in store. Not sure how these are set up in Item File but these are clearly different - lighter in weight and poorer quality. Loop on heel does provide one mark of difference but should have different name than heavier George shoe. I bought these because heavier George shoe is always sold out in stores in size 9. Have been to about 8 stores and can't find it. After only a week they started to peel and look like horrible . For the same money i was able to get a pair from payless that are much nicer and durable. The shoe that I ordered is jarmOn,the shoe I received is jarmAn which is a slip on.the shoe I ordered is a tie type. 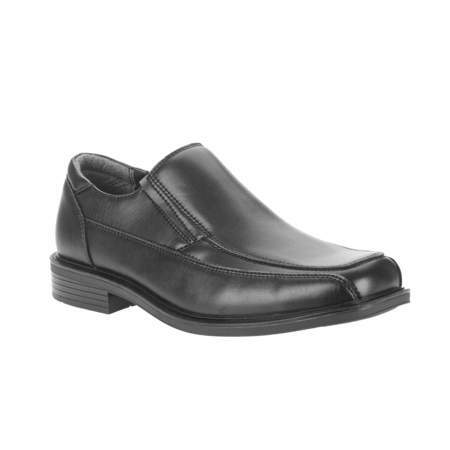 I cannot wear a slip-on shoe ,took wrong shoes to local Walmart store and got my money back.